With every passing iOS update from Apple, the variety, inventiveness and overall appeal of music-making apps for the iPad and iPhone just grows and grows. 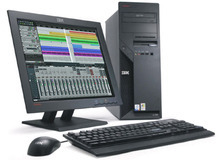 Yet most computer musicians and producers do the bulk of their work on a Mac or PC with desktop software. To help you pair the immediacy and fun of iOS music making with meaningful production for your projects, we offer up the following selection of hardware and iOS apps. These products all give you the ability (or at least the potential) to start your production or sound programming in your iOS device and later finish it on your Mac or PC. Many iOS synth apps sound just as good with almost as many features as their plug-in counterparts that cost ten times as much. Usually the problem is that you can't incorporate iOS synths into your DAW sessions as integrally as a plug-in. The iConnectivity iConnectAudio4+ ($299.99), a 24-bit/96kHz resolution interface, works around that roadblock by hosting two "computer" devices—Mac, PC or iOS device—at once. So you route your iPad's audio into your DAW and sync its MIDI to your DAW as well, effectively making an iOS synthesizer a touch-sensitive plug-in; that's the dream come true for iOS and desktop music-makers. It's iConfig software lets you set up and save all your audio/MIDI routing setups, which are also stored in flash memory on the interface. 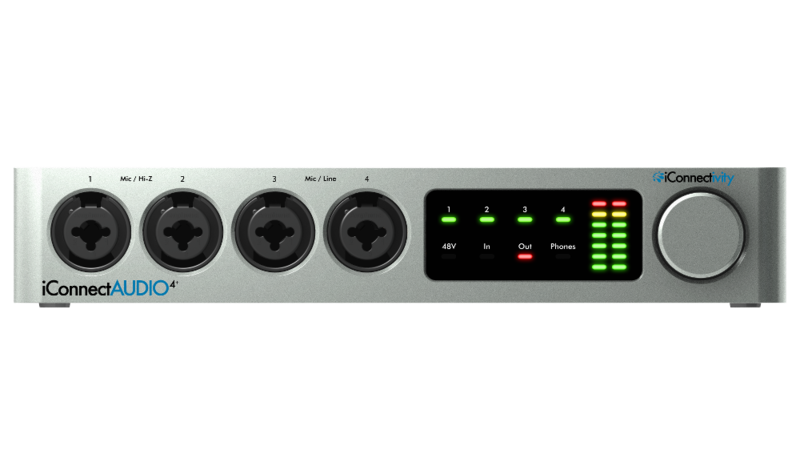 Besides that, the iConnectAudio4+ supports up to eight USB MIDI peripherals (connected to a powered hub sold separately); 5-pin DIN MIDI instruments; mic-, instrument- and line-level audio inputs through four XLR/TRS combo inputs; and has four balanced TRS outputs, as well as a stereo headphone out. Lower-price alternative: Novation Audiohub 2x4 ($199.99). It doesn't have the same capabilities for integrating an iOS devices audio and MIDI into a DAW, but it's powered 3-port USB hub makes it convenient to keep all your crucial MIDI peripherals up and running. Enthusiasts know Apogee best for both outstanding audio quality in its components and for catering to Apple users. The company has extended that reputation to iPad and iPhone users. The 24-bit/96kHz Apogee MiC 96k ($229) is a USB microphone that supports direct plug-and-play connection to Lightning devices running iOS 8 and Macs running OS 10.10 Yosemite. The MiC 96k was designed for hassle-free vocal and instrument recording, so it needs no configuration. The condenser mic features a cardioid polar pattern, die-cast zinc metal body and steel mesh mic capsule housing for durability, input level dial, and a multi-color LED showing input level and power status. It also comes with a USB-to-Lightning cable, removeable tripod tabletop stand and standard microphone stand adapter. Lower-price alternative: IK Multimedia iRig Mic HD ($129.99). Also connecting directly to iOS Lightning devices and Mac/PC computers, the iRig Mic HD is a handheld condenser mic with an audio resolution of 24-bit, 48kHz. 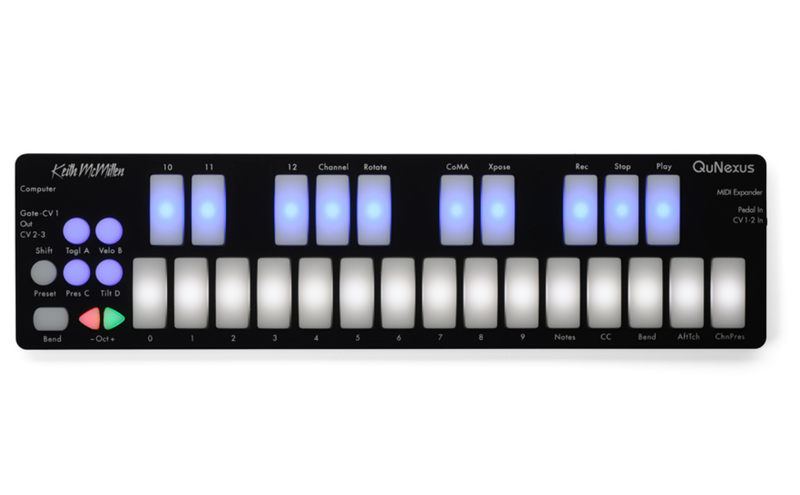 Portable, insanely durable, versatile and expressive, the Keith McMillen Instruments QuNexus ($149) can be plugged directly into computers and iOS devices and also connects to and controls MIDI and CV analog gear to incorporate everything in your studio. The 25 button/keys have Smart Fabric technology for micro-sensitivity of velocity, pressure and tilt. If all you need is USB connection to a computer or iOS and Android devices, without controlling external MIDI and CV gear, try the company’s lower-priced KMI K-Board ($99). The new Akai Pro MPD2 series of USB drum-pad controllers are all class-compliant for Mac/PC computers and iOS devices (requiring an Apple Camera Connection Kit, sold separately). They feature newly designed, ultra sensitive MPC pads, Note Repeat, endless rotary encoders and three control banks for the physical controls. Three models let you find your sweet spot between portability and features: MPD218 ($99); MPD226 ($199), with multi-colored pads, display and faders; and MPD232 ($299). The first three iOS music apps we'll cover here all have Mac/PC plug-in counterparts, which allow you to either import and export sounds between platforms, or at least start in iOS and then open your work in the desktop version. Of course, in order to make the crossover work, you'll need to purchase both the plug-in and the app versions. Cakewalk adapted its underrated Z3TA+ 2 plug-in ($99) into the Z3TA+ iOS app, and it's a bargain because it maintains nearly all of the features and sound of the full plug-in version in a highly efficient app interface including an X/Y touchpad. Each patch can have up to six oscillators, eight envelopes, six LFOs and six effects. There are two filters per patch and 14 filter types. There's a well-appointed arpeggiator and a powerful modulation matrix for routing 16 modulation sources to all kinds of destinations. This example of the Z3TA+ iOS begins with the Alien Forest preset that has added X/Y pad manipulation of filter cutoff and oscillator pitches. The second half switches to the arpeggiated Space Bell Donk preset with extra x/y pad manipulation of filter resonance. Like Z3TA+ iOS, the Waldorf Nave wavetable synth app can import and export presets to the companion Waldorf Nave plug-in version ($199, AAX/AU/VST). Nave originated on the iPad and immediately stunned users with its scope. 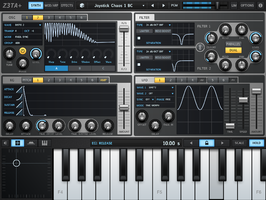 The inventors of wavetable synthesis, Waldorf included the wavetables from its Wave, Microwave and Blofeld synthesizers. You can also create wavetable visually from the spectral view, by analyzing external audio or by using a speech synthesizer. Two independent wavetables combine with an oscillator module to create an enormous breadth of sound, from thick and dirty to pure and shimmering. 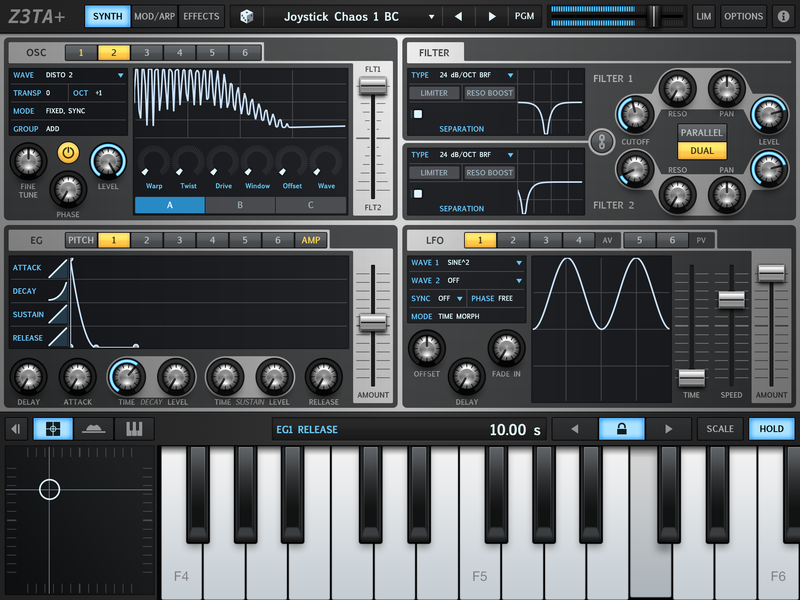 Synth buffs should never be bored with Nave. 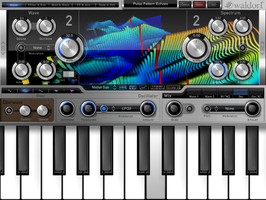 Besides its innovative wavetables, its deep interface includes a modulation matrix, x/y touchpad, five effects modules, an arpeggiator, a four-track recorder that saves single-track or mixed down WAVs to iTunes file sharing, and much more. This audio example was created using Nave's built-in four-track recorder and a few of more than 500 excellent preset patches. For many hip-hop and electronic producers, Native Instrument Maschine hardware/software system has taken over the mantel as the centerpiece for pad-based beat production. 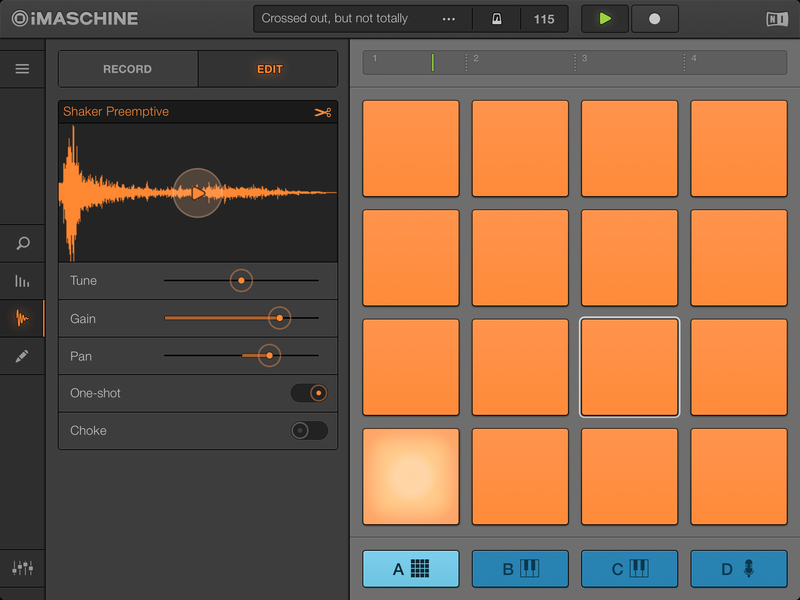 The iMaschine app is Maschine's mini-me for the iPad and iPhone. It comes with drum and instrument sounds taken from Maschine's factory library, and many iMaschine expansion packs let you add to your library for $0.99-2.99 each. With iMaschine, you can play and record percussion and instrument parts with overdubbing, erase, and some basic pattern editing. The sounds are editable and you can also record and edit your own samples to add to your patterns or your library. The four-part sequencer—drums, two instruments and a voice track—also has a mixer screen with seven effects to add to any track. You can export projects to Soundcloud, but best of all, you can export the all the samples and the patterns as a Maschine project for opening seamlessly in your Maschine desktop software (sold separately). Here's a four-bar loop we made with iMaschine's included sounds, the Preemptive drum kit, SubBass bass and Songstress lead. The Chorus effect is applied to the drums and bass; a highpass filter sits on the lead synth. One of the all-time great names in sound synthesis created the Animoog polyphonic synthesizer especially for the touchscreen manipulation on an iPad. It brilliantly captures the sonic highlights of Moog's large synthesizer lexicon in a unique and intuitive interface featuring an X/Y space, 4-track recorder and customizable keyboard that lets you choose a music scale. Its preset library of bass, lead, pad, plucked, keys and FX sounds sound as luscious and high-end as anything in the app store, and you stack up to eight timbres from the timbre library to make your own patches. 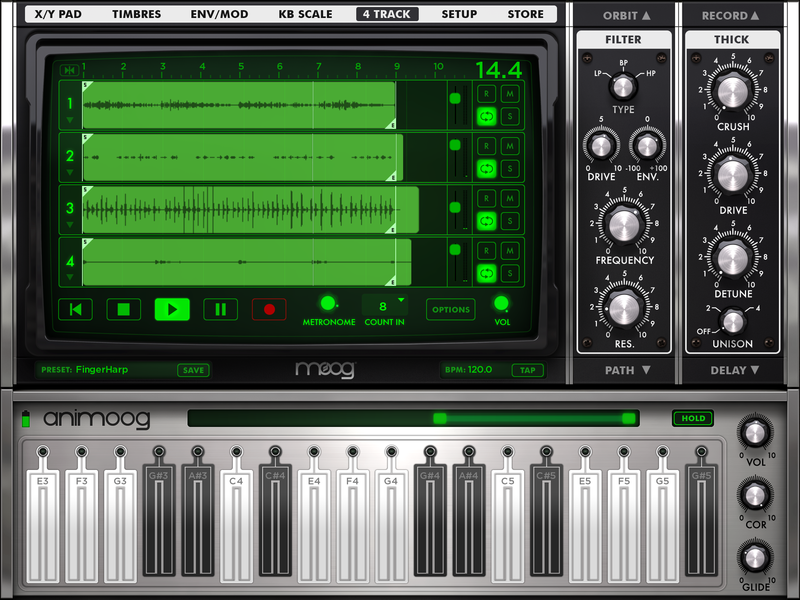 While there's no equivalent Animoog desktop plug-in, this app sets the gold standard for synth app sounds, so it's worth the investment whether you use it with the iConnectivity interface, export its 4 Track recordings to Soundcloud or just record it straight from the iPad's output. 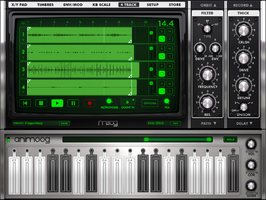 This example uses Animoog's 4-track recorder to make a loop with two custom patches and two presets. 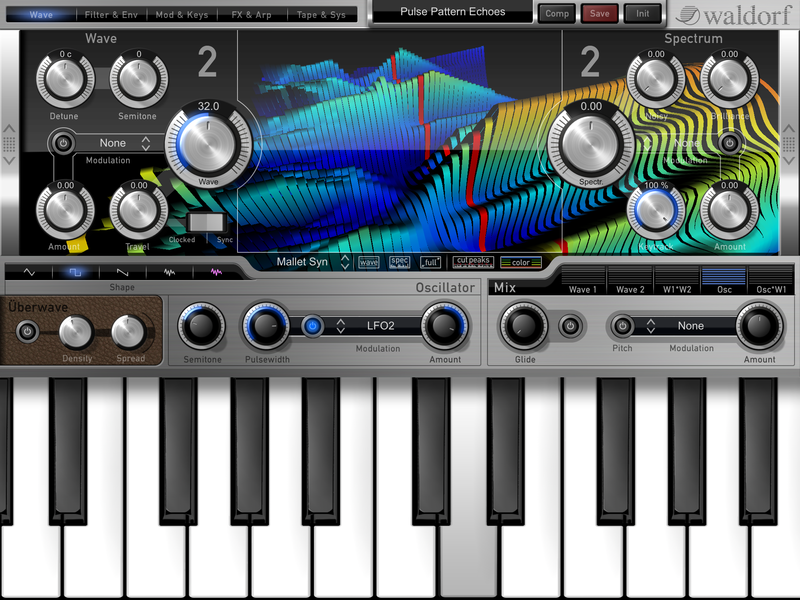 The sounds exhibit some of Animoog's range but only scratch the surface of its enormous and gorgeous sound palette.